Are you trying to save a little money when it comes to servicing your car in Salem? Take a look at these great car service and maintenance offers! Save time and save on maintenance. Experience Mercedes-Benz of Salem! We will match any valid service offer, coupon, or service special from any other local authorized Mercedes-Benz dealer. Please present offer at time of write-up. Cannot be combined with any other offers or specials. Cannot be applied to a previous purchase. Offer has no cash value. Offer valid only at Mercedes-Benz of Salem. 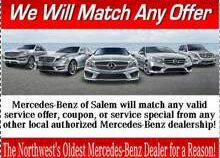 Valid at Mercedes-Benz of Salem. Not to be combined with any other offer, coupon, and/or discount. Must present coupon at time of purchase/service write-up. No cash value for coupon. One coupon per person or household. Other restrictions may apply. Please see dealer for complete details. Present your active Military ID and receive 12% off your Mercedes-Benz Maintenance Service. We honor the brave men and women who have selflessly served our country and risked their lives to protect our freedoms! We thank you for your service. 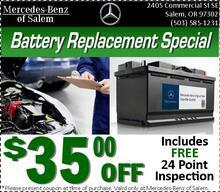 Present this offer at your next visit to Mercedes-Benz of Salem and save $35.00 off your next Genuine Mercedes-Benz battery replacement. Includes FREE 24 Point Inspection.